Squamoid eccrine ductal carcinoma (SEDC) is a rare primary cutaneous tumor that exhibits both squamous and adnexal ductal differentiation. Till date, only nine cases of SEDC have been reported in the literature. The cell of origin of these tumors is controversial, as it may represent squamous cell carcinoma (SCC) arising from eccrine ducts or a subtype of eccrine carcinoma (EC) with extensive squamoid differentiation or it could represent a biphenotypic carcinoma. , They have been classified both as variants of cutaneous SCC and as a type of EC. SEDC often presents in the middle-aged or elderly as a hard, usually non-ulcerated, single or multiple cutaneous nodules and shows a predilection for the head, neck, and extremities. The tumors are generally poorly circumscribed and show an infiltrative growth pattern with a deep extension into the dermis and subcutaneous tissues. 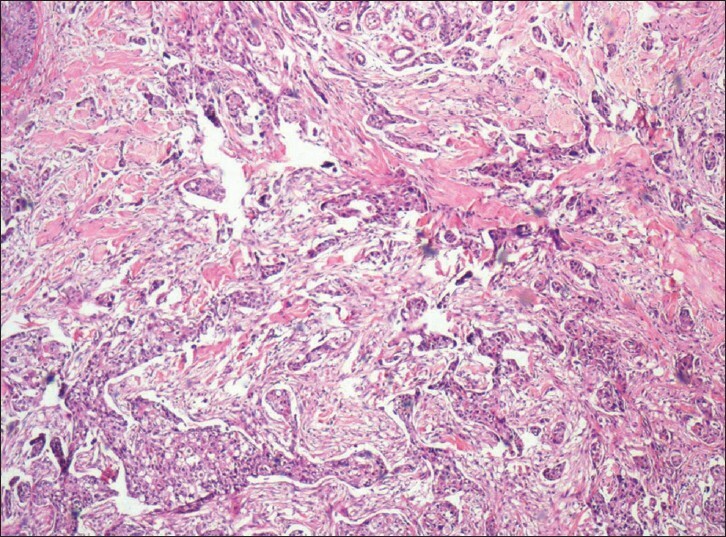 The histological features include duct-like structures resembling the dermal part of the eccrine duct and atypical squamous cell clusters. As these lesions have an indeterminate malignant potential, attention has been directed toward making a definitive histological diagnosis for an effective potential therapy that minimizes the risk of recurrence or metastasis. We hereby report a case of SEDC that presented as multiple swellings over the scalp. A 58-year-old man presented with history of two gradually increasing nodules on the scalp since 3 months. On examination, the two nodules over the scalp were of 1 × 1 cm each and one of them showed a punctum-like area in the center which prompted to arrive at a clinical diagnosis of sebaceous cyst. Both the nodules were excised completely and subjected to histopathological examination. Microscopically, the sections from both the nodules revealed tumors in the dermis composed of duct-like structures and squamoid cells in nests and in an infiltrating pattern [Figure 1]. The cells lining the ducts showed moderate pleomorphism and had vesicular nuclei and prominent nucleoli [Figure 2]. The squamoid cells had abundant eosinophilic cytoplasm and large, irregular hyperchromatic nuclei. They were seen infiltrating into the deep dermis and were forming squamous eddies at places [Figure 3]. There was dermal sclerosis and perineural infiltration seen in the periphery. 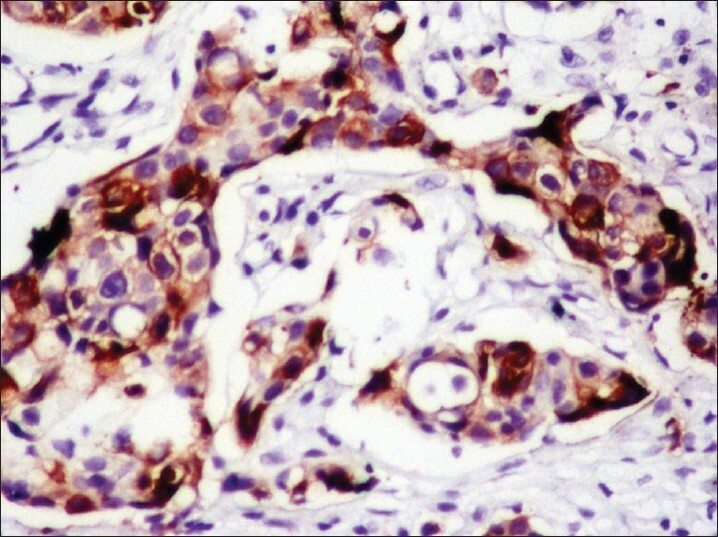 Immunohistochemically, the lesion was positive for cytokeratin (CK) 5/6 [Figure 4], epithelial membrane antigen (EMA) [Figure 5], and p63 [Figure 6]. The resected margins of both lesions were free of tumor and no further treatment was administered. The patient is being followed up for the past 6 months and has no recurrence. Limited information is available about the management of SEDC because of its rarity. For a definitive treatment of ECs, surgical extirpation with complete margin examination is recommended as the lesion tends to be underestimated in its size, is aggressive in its infiltration, and has a proclivity for perineural and perivascular invasion. Mohs micrographic surgery (MMS), the established and successful surgical procedure followed in a variety of cutaneous malignancies, is recommended as it is proven to be effective, yet tissue sparing and has a lower recurrence rate than the other treatment modalities. , Thus, given the uncertainty of SEDC's etiology, malignant taxonomy with pathologically demonstrated invasive potential, recurrence rate, and ambiguous metastatic potential, it is important for the physicians to be aware of this entity to arrive at a proper diagnosis. Also, further experiences with this tumor are necessary and a close follow-up of these patients is suggested. Kavand S, Cassarino DS. 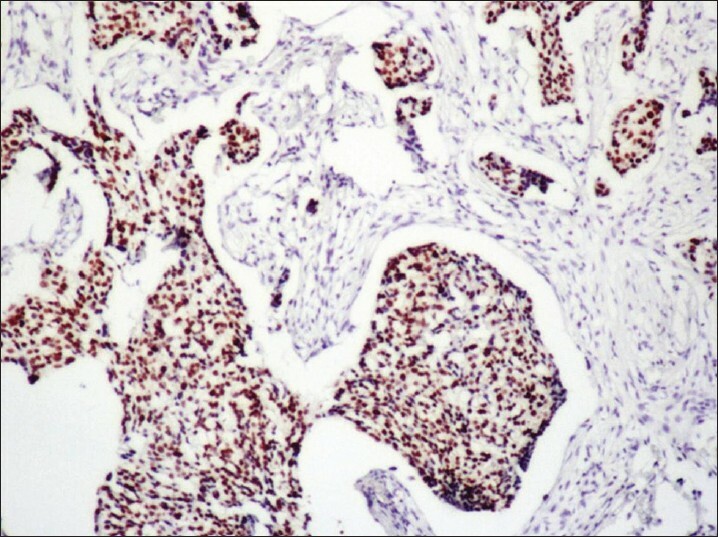 "Squamoid eccrine ductal carcinoma": An unusual low-grade case with follicular differentiation. 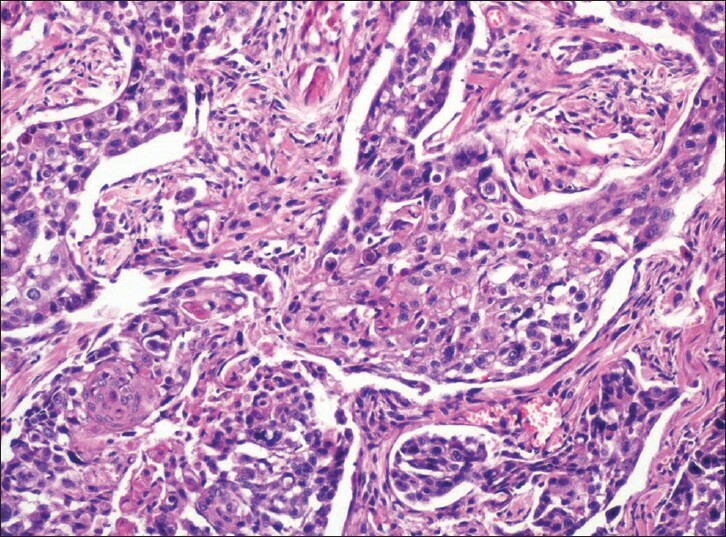 Are these tumors squamoid variants of microcystic adnexal carcinoma? Am J Dermatopathol 2009;31:849-52. Clark S, Young A, Piatigorsky E, Ravitskiy L. Mohs micrographic surgery in the setting of squamoid eccrine ductal carcinoma: Addressing a diagnostic and therapeutic challenge. J Clin Aesthet Dermatol 2013;6:33-6. Cassarino DS, De Rienzo DP, Barr RJ. Cutaneous squamous cell carcinoma: A comprehensive clinicopathologic classification--part two. J Cutan Pathol 2006; 33:261-79. Jung YH, JO HJ, Kang MS. Squamoid ecrine ductal carcinoma of the scalp. Korean J Pathol 2012;46:278-81. Chhibber V, Lyle S, Mahalingam M. Ductal eccrine carcinoma with squamous differentiation: Apropos a case. J Cutan Pathol 2007;34:503-7. Wick MR, Swanson PE. Cutaneous Adnexal Tumors: A Guide to Pathological Diagnosis. Chicago, IL: American Society of Clinical Pathologists Press; 1991. p. 10-3. Wong TY, Suster S, Mihm MC. 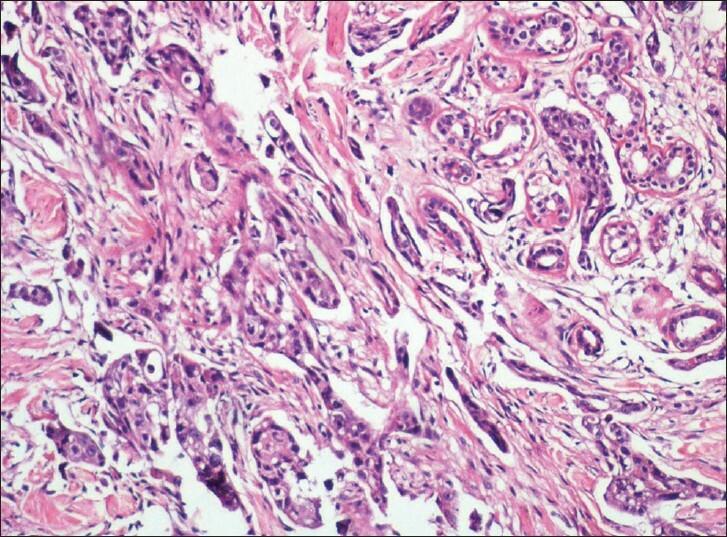 Squamoid eccrine ductal carcinoma. Histopathology 1997;30:288-93. Cruz DJ. Sweat gland carcinomas: A comprehensive review. Semin Diagn Pathol 1987;4:38-74. Terushkin BS, Leffel DJ, Futoryan T, Cowper S, Lazova R. Squamoid eccrine ductal carcinoma: A case report and review of the literature. Am J Dermatopathol 2010;32:287-92. 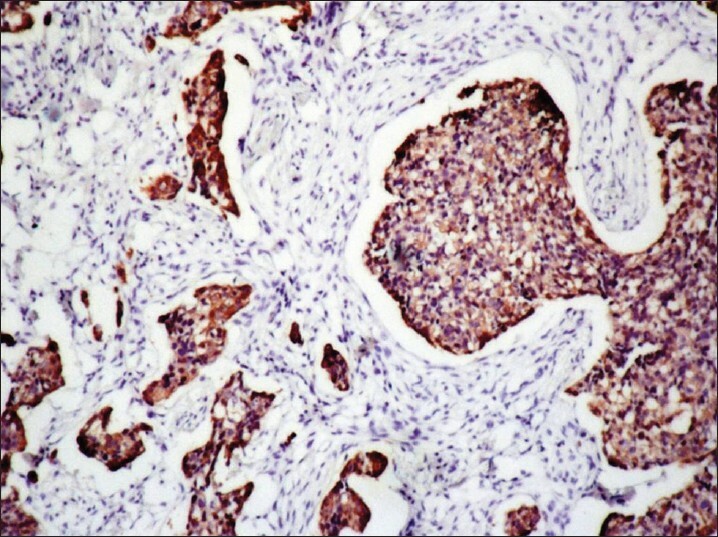 Kohda M, Manabe T, Ueki H. Squamous islands in eccrine neoplasms. Am J Dermatopathol 1990;12:344-9. Qureshi HS, Ormsby A, Lee MW, Zarbo RJ, Ma CK. The diagnostic utility of p63, CK5/6, CK 7, and CK 20 in distinguishing primary cutaneous adnexal neoplasms from metastatic carcinomas. J Cutan Pathol 2004;31:145-52.